Ok so I need your guys's help. I cannot for the life of me decide which kind of fabric to use for this next dress I'm making. 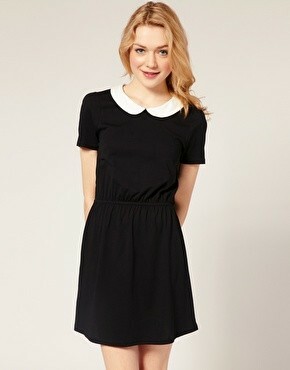 It's going to be a Peter Pan collar dress (of course, I'm obsessed.) with a fitted bodice and a box-pleat skirt. (kind of like inverted pleats). The problem is the fabric. There are so many different options and I can't make up my mind. I have it narrowed down to 4 options though.. 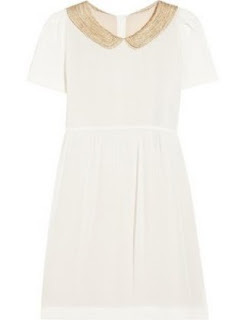 I think..
Option 1 : White with gold collar. Option 2 : Black with white collar. Option 3 : White with black collar. Option 4 : Salmon pink with white collar. Option 5 : Black polka-dots with white collar. 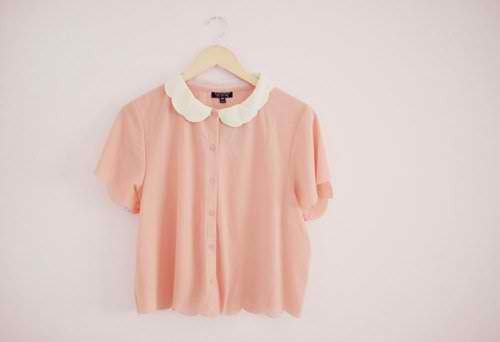 Option 6 : Lace with white collar. Ok I lied, I have it narrowed down to 6 options. If anyone out there has any suggestions, please do tell me because I am driving myself crazy trying to decide. In other news, this is off-topic but I am bouncing off the walls with excitement right now so I thought I'd share. I was featured on Lauren Conrad's blog today. Yes as in THE Lauren Conrad. The one and only beautiful Lauren Conrad who dated the cutest guy ever and made my middle school years bearable. ha I am literally dying over excitement.